Safety study shows Marx Big Wheel most stable tricycle design tested in U.S.A. The original Big Wheel with two new features. A handy saddlebag, and a firm-grip handbrake that lets him slow down and stop without dragging his feet. For kids 4 to 7 years old, weighing up to 65 pounds and 40 to 55 inches tall. The smallest of the Big Wheel line. For tots 1 1/2 to 3, weighing up to 45 pounds and 30 to 38 inches tall. Like the Big Wheel, only smaller. And just as safe. For the 3-year-old up to the 6-year-old who is short for his age. 60 pounds maximum. 40 to 55 inches. A scaled-down Big Wheel for 2 1/2- to 4-year-olds. Features low-slung stability. Scoop contour seat. Oversized front wheel. For kids 38 to 45 inches tall, weighing up to 50 pounds. A five-month study on the safety performance of the best-known tricycle designs in the United States has just been completed for the Department of Health, Education and Welfare's Bureau of Product Safety. 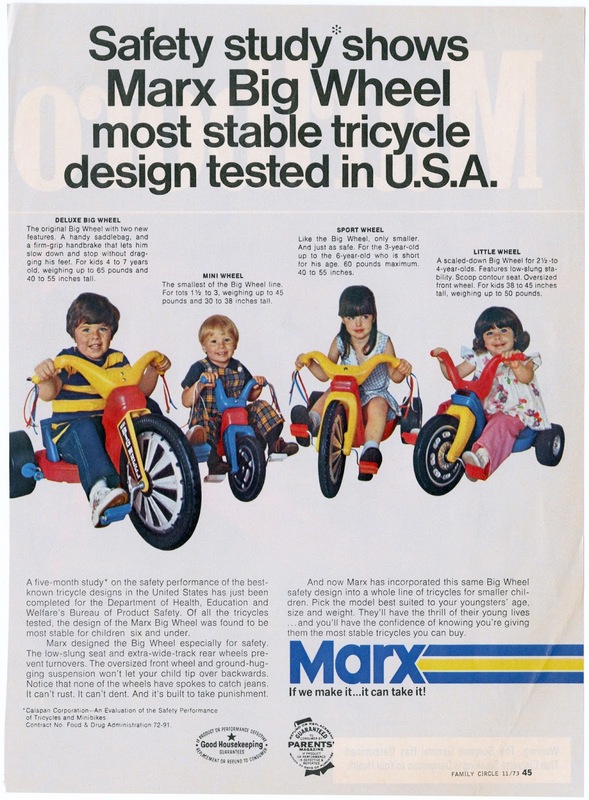 Of all the tricycles tested, the design of the Marx Big Wheel was found to be most stable for children six and under. Marx designed the Big Wheel especially for safety. The low-slung seat and extra-wise-track rear wheels prevent turnovers. The oversized front wheel and ground-hugging suspension won't let your child tip over backwards. Notice that non of the wheel have spoke to catch jeans. It can't rust. It can't dent. And it's built to take punishment. And now Marx has incorporated this same Big Wheel safety design into a whole line of tricycles for smaller children. Pick the model best suited to your youngsters' age, size and weight. They'll have the thrill of their young lives... and you'll have the confidence of knowing you're giving them the most stable tricycles you can buy. If we make it... it can take it!